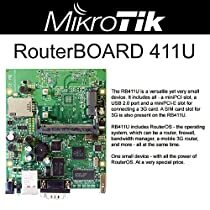 Mikrotik RouterBOARD 411U, RB/411U, RB411U, Atheros AR7130 300MHz, Router, Firewall, Bandwidth Manager, Mobile 3G Router, 32MB onboard memory, 1 X 10/100, 1 X MiniPCI slot, 1 X MiniPCIe slot for 3G modem, USB 2.0, all the power of RouterOS v3, Level4. RB411U is a versatile yet very small device. It includes all - a miniPCI slot (for 802.11 wireless cards), a USB 2.0 port and a miniPCIe slot for connecting a 3G card (does not support 802.11 wireless cards). A SIM card slot for 3G is also present on the RB411U. The RB411U mounting holes are in the same location as other RB411 models, so you can easily mount it into any supported outdoor case/antenna. You can use the USB port to attach a secondary storage device, or a USB 3G modem.